Today I concentrate on my process and inspirations for the arrangement of ‘Mike icons’, below. I used blue ink to generate a thick maze-like design on my paper and a black ink pen for icon details and sawtooth lines. My idea was to crumple the paper after creasing it along the lines of the blue design. This, I thought, would create rectilinear as well as random insults to the paper that would absorb pigments that I planned to apply. But the 90 pound paper mostly fell apart along the lines of the sharp creases after I soaked it in water. This mini-catastrophe forced me to consider other options. I intended to fit the pieces back together and continue along. It occurred to me however, that I was not constrained to put the rectangles back in their original positions. So I had fun rearranging them, irrespective of the design on each scrap of paper. A few days ago I experimented with stitching onto watercolor paper (Stitched). I put that into practice by sewing the patches of paper into their new positions on another sheet of watercolor paper. I did this all by hand after the paper dried sufficiently. Many thoughts filtered through my mind as I was “mending” my artwork. Somehow, Willem de Kooning’s statement, “Flesh was the reason oil paint was invented,” came to me as I was handling this moist, floppy, double-thick piece of paper. It felt like I was handling a large section of skin. This put my sewing in a different light. I was like Dr. Frankenstein trying to breath life into a patchwork of images. I integrated my stitching with the pen and ink designs of some of the squares. I stitched some of the squares to each other, some I just sewed to the backing paper. When I completed the sewing, I painted the seams red, as if the flesh was wounded. I painted flesh tones in some rectangles and along some of the ink lines. My process in assembling and literally tying different sections of ‘Mike icons’ together was a lot like my life-long process of trying to understand my brother, trying to breathe life into my relationship with him. 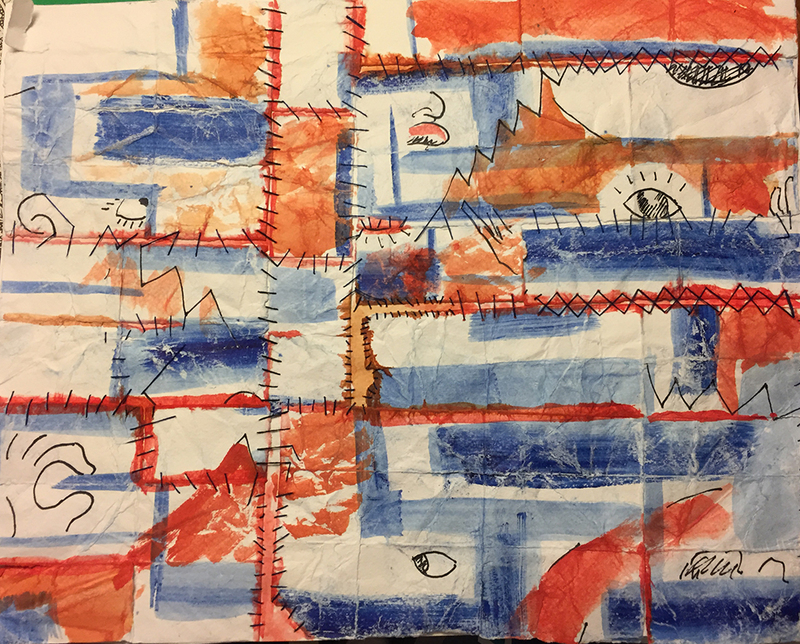 This entry was posted in Mike, Personal Stories and tagged abstract art, artistic process, autism, autism siblings, creative process, creativity, flesh, Frankenstein, stitching, Willem de Kooning. Bookmark the permalink. I like this piece. I think it is the black stitching that does it for me. Thanks, Dr. V. Skillful handiwork, no? You could definitely suture a gash or two! Hahaha… scars would be ugly tho! Thank you, K, for the idea!